This is the final entry in the Herschel Launch Campaign journal series, which ran from February 2009 until just before launch in May 2009. 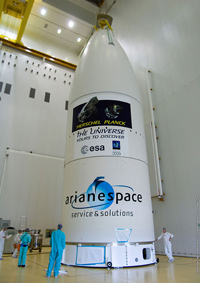 The journal covered the main activities during the period leading up to launch: from the shipment of the spacecraft to the launch site in Kourou, to the final integration of the spacecraft with the launcher. This journal series followed the Herschel Test Campaign journal series, which ran from August 2005 to February 2009 (see link in right-hand menu). 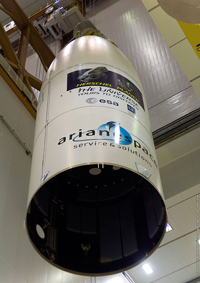 On Sunday 10 May the Ariane 5 ECA fairing was lowered over the Herschel spacecraft and the SYLDA, under which the Planck spacecraft sits, to be integrated finally with the launcher. 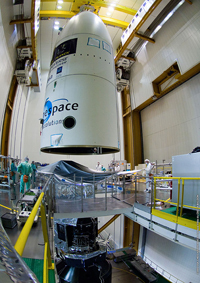 Both spacecraft are now ready for the launch scheduled for 14 May at 13:12 UTC. Following the integration of the Herschel spacecraft on top of the SYLDA on 30 April the main activity of the past week has been the filling and final topping up of the helium-II tank in the Herschel cryostat. In the morning of Sunday 10 May the required filling level of helium-II had been achieved with the cryostat about 96% full and at a temperature just below 1.7 Kelvin. Prior to placing the 2.6 tonne, 17-m-tall fairing over the Herschel and Planck spacecraft, the helium-II tank in the cryostat was closed, the helium filling equipment was disconnected, the spacecraft was powered down and the ground umbilical cables removed. 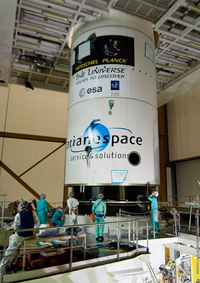 The fairing was hoisted to the full height of the BAF assembly room and manoeuvred above the launcher (and above the two satellites). 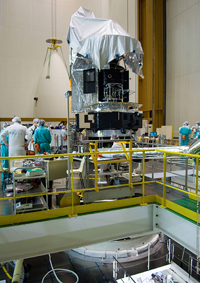 One of the final acts was to remove the protective foil covering the Herschel telescope before the fairing was lowered, encapsulating the two satellites, with Planck under the SYLDA, and mated finally with the launcher. 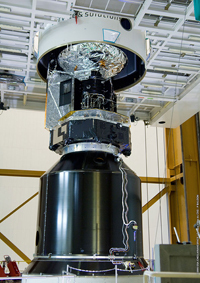 Once the fairing had been integrated with the launcher, the ventilation and electrical lines were reconnected, the spacecraft powered-on and a number of functional tests performed to check the status of the Herschel spacecraft following these latest activities, including command checks from the launcher to some of the cryostat valves. 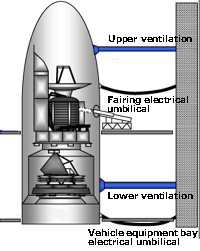 The ventilation lines allow for the environmental conditions of both spacecraft to be regulated. The ambient temperature is kept at about 11 degrees C and the humidity level is low. At this stage the Herschel cryostat was 96% filled with helium-II at a temperature just below 1.7 Kelvin. In order to keep the system cold for the final days on Earth, the vent lines on the three shields around the cryostat must be flushed with helium. To connect the lines, operators had to move about on diving boards that had been placed through the small doors in the fairing to the cryostat. The operators reopened the cryostat, connected the vent lines on the shield and then started to flush the shield surrounding the main helium tank continuously with helium from an external dewar sited on the upper elevating platform outside the fairing. This will continue until the day before launch at which time the cryostat will be closed, all external and auxiliary connections removed and the doors of the fairing closed.